This is the translation of a youtube clip showing interviews with Tahia Carioca and Samia Gamal. The clip shows two separate interviews, with similar questions, interwoven with each other. The interviewer with Samia Gamal is Tarik Habib, and the interviewer with Tahia Carioca is Mona Gaabr, a well-known interviewer and actress. The information on the youtube clip does not identify what date these interviews were aired. It was probably in 1974, considering the comment Samia makes about being 50 years old. Explanatory comments offered by the translator appear in parentheses after some of the statements. Interviewer: Tell me about Taheya the human being. Taheya: When I am on the stage I'm Taheya the artist, but when I take my makeup off, wear my regular clothes, go to the moulid, mingle with the people who come to the moulid, and share food with them, I feel very happy then. Samia: Just like I am now sitting with you, the human being, when I am at home taking care of my husband's needs and running my own affairs. Interviewer: When do you feel you are Samia Gamal and when do you feel that you are Madame Roushdy Abaza? Samia: I feel I am Madame Roushdy Abaza all the time. Tahia: At home I feel I am Madame Faiz Halawa. Interviewer: Who do you think has the happiest marriage in the entertainment business? ... and we will cast the evil eye on them! Samia: You will not cast the evil eye! Tahia: because they are not married, of course! Interviewer: In your opinion what causes love to end? Samia: Of course this is 100% and very important. Interviewer: It appears from your answers that you followed this proverb. Samia: Thank you, this is my nature, just like that. Tahia: A lot of people think I am impolite but I am not... I'm straightforward. I will tell the wicked to his own face, as they say. Interviewer: Which proverb do you believe is correct? Samia: Live and let live. Interviewer: And which proverb do you believe is not correct? Tahia: The one I don't believe is "If you take your time, you will be safe, and if you rush you will regret it." 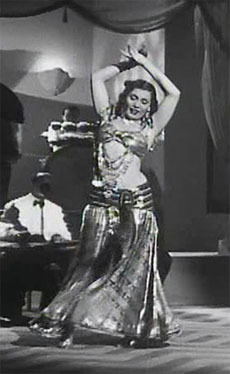 ABOUT THE PHOTO: This image is a still of a scene of Taheya Carioca dancing in Shatie al-Gharam (Shore of Love). Interviewer: I'll tell you the names of some of films and you tell me which one of today's young stars can play your lead role in a remake. 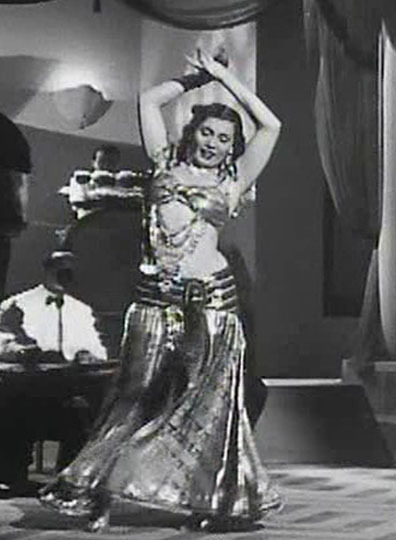 Samia: I would give this one to Mervat Amin, because I heard she dances well. Samia: No, this one leave it for me because I loved this film very much, I have hoped to do the remake myself. But I don't know if I could make a 50-year-old genie, I don't know. Samia: Ta3alah Salem, perhaps Nilee can do it. Interviewer: The young, who could perform your lead roles in these films if there was a remake. Tahia: Oum al Aroussa. Ah, they all look alike with the wigs. It's very strange. They all are the same color and look alike... her hair is blonde in this one, her hair is red, they are the same, just pick one. Mix them up and choose anyone. Interviewer: You mix them up and choose. Tahia: Oum al Aroussa. Mervat. ABOUT THE PHOTO: The photo shows Samia Gamal with Farid al-Atrache in a scene from Afrita Hanem (Genie Lady). Interviewer: The last film you saw and liked. Tahia: El A'sharah el Tayibah .. Saaid darwish. Interviewer: In your opinion whom do you think is the top theatrical star? Tahia: This thing about stars... It is too big. We are too generous with titles. Maybe Safa'a and Neilee. It's not a star like a star it is too big. Interviewer: Do you prefer seeing a dancer use famous / popular tunes or tunes composed specifically for her? Interviewer: Can you tell me, Madame Samia, the difference between dancing in a hafla, in a nightclub and in a wedding? Samia: I personally prefer the nightclub, because I am closer to the audience and I live with them. The theater places too much distance between the people and me. The weddings - I didn't like those very much. Samia: Because there are too many children, and this is the kind of dance that needs large floor space. You don't want to be in a tight spot between the adult guests and a lot of kids. There is also another problem that I didn't like it at all - who should I please - the mother of the bride or the mother of the groom? Each of them keeps pulling at me and asking me why I'm dancing for the other one and telling me to dance for her. That's why, when I did weddings, I preferred to have them at the Mena House hotel, for example, as they used to do in the old days, or in a sports club. Tahia: They are all worse than the others! I didn't try it. I only danced at the theater and if I did dance in a wedding it was mainly for my friends, it was either friends or relatives. Interviewer: In the olden days dance was accompanied by a song. Which is the most famous song you have danced to? Tahia: The most famous song.... there are too many between Fared Allah Yarhamh and Abed el Aziz Mahmoud and Karem... too many. I stopped dancing at approximately your age. Interviewer: There is not a specific song? Rushdy Abaza: The Don Juan of Egyptian Cinema. Samia Gamal mentioned her marriage to Rushdy Abaza in the interview on this page. Check this link to learn more about their years together! Samia Gamal Talks About Farid al-Atrache in an Interview. The love of her life. Many thanks to Mahmoud Sami for translating this interview! And many thanks to Priscilla Adum for the information about Mona Gaabr, Tahia's interviewer.